The RV Doctor: Product Spotlight: A Real RV Plumbing Miracle! 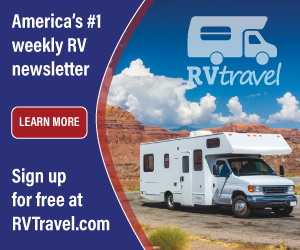 Product Spotlight: A Real RV Plumbing Miracle! Dear RV Doctor, I think there is something wrong with the monitor panel in my RV. I just dumped both holding tanks and still the 1/4, the 1/2, and the Full lights are lit for the black water holding tank. On the gray tank, it still shows 1/4 full. The water tank, however, registers fine. I know the holding tanks are completely empty... I just emptied them! Do I need to replace the monitor panel? Oh, if only I had a quarter for every question like the one above that has come into the RV Doctor Column over the last three plus decades! Not a week goes by that I don’t receive a similar email. Gary, are you saying this problem has been around for over thirty years? Sadly, yes! The good news is that there is now a very real and very reliable solution. But first, here’s a little explanation of how those in-tank monitoring probes become fouled, resulting in those erratic indications at the monitor panel. In-the-tank probes literally extend through the sidewall of the holding tank and well into the tank. Most waste tank probes extend horizontally into each tank (some fresh water tank probes were vertically installed). As the tank fills with waste, the liquid portion of the contents would make contact with each probe positioned at various levels up the wall of the tank. Some tanks have probes positioned at the 1/4, 1/2, 3/4 and Full levels. Other tanks are divided by thirds; 1/3, 2/3 and Full. In addition to the three or four probes at individual levels, there are also one or two additional probes mounted alongside the column of level probes. These “common” probes ultimately connect to one specific circuit at the monitor panel for that tank. Here’s an inside view of a tank with four level probes and two common probes. In a nutshell, as the liquid rises inside the tank, (remember, water is conductive), it makes contact with at least one of the common probes and each successive level probe, thereby completing that circuit and lighting that lamp or LED on the monitor panel inside the RV. The typical probe or “well nut” is nothing more than a stainless steel machine screw threaded through an imbedded brass nut inside a rubber grommet. Tightening the machine screw effectively creates a leak-proof seal and attaches the monitor panel wire to the probe. Another type of well nut has the screw reversed. 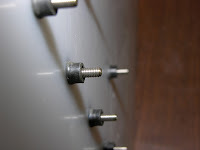 An installation nut, plus a nut to secure the monitor panel wire, is located on the outside of the tank while the screw “head” actually becomes the portion that contacts the tank contents on the inside. As you can see in the photo at the left, the screw portion of typical well nuts extend quite a way into the tank, creating a very nice set of “hooks” – the perfect hook, in fact, for waste and sludge to adhere to and to ultimately bleed conductance to other probes. The metallic portion of the machine screw is actually fairly close to the tank wall. And this is the very reason the monitor panel will eventually create false indications. Tissue, waste and sludge will build up over time, creating in essence, a short circuit between the probes because of the low resistance between the probes, the tank wall and each other. Moist tissue draped over the probes will most certainly pass enough conductance to “trick” the monitor panel into thinking that tank still contains waste. So what is to be done? Well, for years we’ve recommended holding tank additives, thorough rinsings, even bags of ice cubes (in the black holding tank) to help eliminate this probe-fouling problem, but yet the dilemma persists. 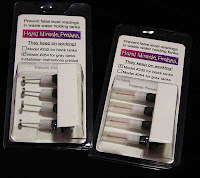 Enter Horst Miracle Probes; www.horstmiracleprobes.com/index.php. Produced by Horst Dynamics, Inc., the Miracle Probes are replacement probes for the common well nut or for any existing in-tank monitor probe, including those that have been installed by a spin-welding process during the tank manufacture. One cursory glance at these revolutionary probes and it should be evident that these high resistance replacement probes are certainly very different. A closer look at the design will reveal the intent behind that design. Simply put, the installation of the Miracle Probes will likely eliminate false monitor panel readings….forever! In fact, because of their design, it’s almost impossible for these probes to foul under normal use. Personally, I doubt it’s possible to render these probes fouled, even intentionally. Take a look at the Miracle Probe designed for the black waste holding tank. Notice the opaque protective Teflon® tubing over the tiny metal portion of the probe? Teflon®, by nature, is non-wetting and self-cleaning. Also notice the white plastic section over the total length of the probe and beyond. This “roof” section literally keeps waste, sludge and tissue from contacting the electrical portion of the probe. Because of the protective roof, the black tank Miracle Probe must be installed to the correct orientation to ensure the roof section remains situated above the probe. 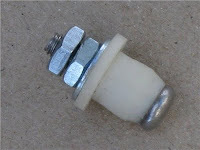 This is effectuated by making sure the non-milled portion of the exterior threaded stud, shown here, is positioned on top while tightening the mounting nut. Notice it even looks a little like a curved roof overhang. There is no special orientation required for the gray tank probes. The gray tank Miracle Probe, pictured here, is also constructed with an opaque Teflon® tubing over the straight metallic section, leaving only the spiral conductive head of the probe exposed and well away from the tank wall. This greater distance from the tank wall coupled with the small diameter of the probe itself minimizes or eliminates the possibility of a false positive or current leakage from one probe to another. The internal construction, that portion you cannot see, is impressive too. The conductive head is internally connected to only the brass stud on the outside of the tank. Everything else is totally insulated from the current carrying components, including the tank wall. The monitor panel can now receive a very precise signal. Imagine that; an accurate monitor panel! Like the common well nut, the Horst Miracle Probes are inserted through a drilled, 3/8-inch hole in the tank wall. 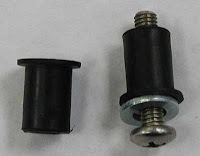 This simplifies the installation such that any existing well nut can be easily replaced. Just be sure the holding tanks are empty first! Then simply reconnect the original monitor panel wiring. No new wiring is required. On some tanks, the existing probes may be spin-welded into the side of the tank; different from the standard well nuts explained above. For fouled probes that are atypical, simply drill a new 3/8-inch hole at the same level as the fouled probe and install the Horst Miracle Probe. Remember, if it’s on the solid waste holding tank, be sure the “roof” section remains on top! So if it’s this simple, Doc, why wasn’t this invented long ago? Well, I’ve learned not to focus so much on the “why” questions, rather, I like to explore the “how” answers. “Why” it took so long, I’ll never know, but I now know “how” to eliminate the problem of unpredictable and unreliable monitor panel readings caused by fouled in-tank probes. And so do you! If you are what I call a “serious” RVer, (you know who you are), you owe it to yourself to investigate this new “miracle” for the RV waste system. If you’ve ever experienced the frustration of inaccurate monitor panel indications, you won’t need much convincing to make the switch to the Horst Miracle Probes. And remember, RVing is more than a hobby, it’s a lifestyle!